Many neurological patterns and habits are at fault when it comes to preventing us from losing weight and living a healthy life. Teaching your body how to stop craving soda is an easy way to cut down on the extra calories you consume a day and reduce the amount of carbonated liquids you drink. Drew Logan, author of 25DAYS, explains how to stay hydrated and healthy without your daily intake of soda. The thing I always ask my clients if they’re having a hard time cutting back on soda is have them tell me how much of their body is made up of carbonated water. Here’s a hint: zero. Your body isn’t made up of carbonated water—it’s made up of H2O. Beyond the obvious extra calories in many sodas, I have clients stay away from diet sodas and even club soda, plain seltzer, and tonic water with good reason. Because of the gas formed by carbonation, any carbonated beverage you choose isn’t absorbed as readily, so it’s never the best choice for staying hydrated. 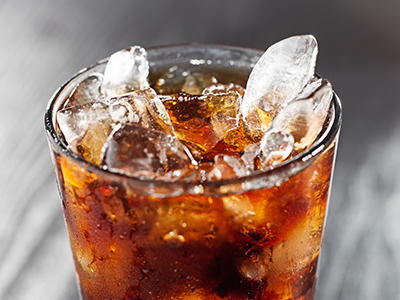 To make matters worse, even if you are stepping away from sugary drinks because of their calories, most likely you’re substituting them with a no-calorie or low-calorie soda that uses other chemicals to achieve that sweet taste you’re craving. Why It’s a Neural No-No. The artificial sweeteners—particularly aspartame, saccharin, and sucralose—found in many diet sodas and drinks have been shown to alarm your brain of an impending caloric crisis, which may increase your impulsivity. Researchers at the University of South Dakota* found that drinking soda containing artificial sweeteners increased the likelihood that subjects would choose a smaller short-term reward rather than a larger reward in the future, suggesting that artificial sweeteners affect your brain’s ability to make decisions. If you desire soda every so often . . .
Then increase how much water you’re drinking per meal and snack. When properly hydrated, most soda drinkers tend to lose their desire for soda. What I also try to get clients to do is switch over to lemon water. But if drinking more water or having lemon water doesn’t cut it, opt for some form of sugar-free, all-natural fizzy water. And by all natural, I mean nothing with aspartame or anything artificial—it must be sweetened with either stevia, a natural sweetener made from the stevia plant, or monk fruit extract, a low-glycemic natural sweetener made from monk fruit, an Asian gourd—both are easily found in any health-food aisle. What people don’t realize is that a lot of artificial sweeteners still raise insulin levels, which will prevent your body from utilizing fat as energy. Personally, I’m not a fan of these types of alternative waters, but if I can’t stop you, then do it the way that is least damaging to you. If none of these suggestions does the trick and you insist on having a glass of soda now and then, here’s the deal: for every serving you drink, it’s an automatic 20 percent deduction from your daily nutrition grade on a Primary Day and 25 percent from your daily nutrition grade on a Secondary Day. I also need you to understand that a carbonated drink is going to cause bloating, either from the gas or the sodium present in most unflavored carbonated water. Plus, know that you won’t be able to get as lean as you would like. 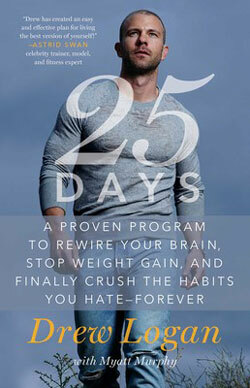 To learn more about the 25Days Diet and nutrition grades, pick up a copy of 25DAYS. Excerpted from 25Days by Drew Logan with Myatt Murphy. Copyright © 2017 by Lucky Brandy, Inc. Used by permission of the publisher. All rights reserved. Celebrity trainer and cast member of NBC’s Strong, Drew Logan shows us how to rewrite our neurological patterns and break the habits that prevent us from losing weight and living a healthy life.Celebrity trainer and cast member of NBC’s Strong, Drew Logan knows firsthand how the brain affects our ability to perform and function at our best. After dying three times in three hours—becoming the world’s only known medical case to survive three sudden cardiac arrests—he lost his short-term memory. He could no longer follow the complicated diet and fitness regimens he’d used on himself and his clients. He needed to create something simpler. He was shocked to discover that the resulting program was even more effective than his complicated regime of the past. In 25Days, Drew outlines a unique, multifaceted approach that helps you rewrite your neurological patterning—what lies underneath those pesky habits that get in our way over and over again—so that the brain’s neural pathways, biochemistry, and hormones work together effectively, seamlessly, and efficiently. Included in the book are the 25 Days Grading System, Diet, and Workout Plan, as well as tools that will alert and assist readers throughout the book. 25Days is “the ultimate tool for fitness” (Jesse L. Martin, actor) and one of the easiest—and most effective—diets to follow. Drew will show you that all you need is to adjust your diet and retrain your brain to be in peak shape and “change your life in ways you never dreamed” (Rick Cosnett, actor).